We are big fans of rice and almost have rice everyday, not for lunch though. Sometimes when we have enough noodles or bread, I like to try something that we seldom eat in lunch. What would it be then? Wait, the idea of cooking some buns came up in my mind the day before yesterday. I cooked buns with chives and pork before. Why not try beef filling this time? I can remember that there’s a little cozy restaurant selling all Shanghai snacks on my way home in Hong Kong. Their beef buns were the best that I’ve ever tried. The buns were very soft with juicy beef inside. Having experimented in making buns several times, my family could enjoy juicy beef buns now. Taking a big bite of beef buns with a cup of tea is a kind of blissful moment I enjoy and treasure. Mix beef with marinade and stir with chopsticks towards one direction only, until the beef sticks together very well with a “springy” feel. Chili in fridge for 20 minutes. 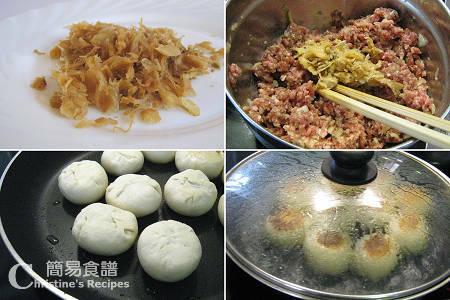 Refer to the method of making buns in my previous recipe, Pan-fried Buns with Chives and Minced Pork Filling. Use the same method to make dough and wrap a heaped teaspoon of beef filling in the center. Seal the edge with the seal facing down. Heat some oil on a non-stick frypan. 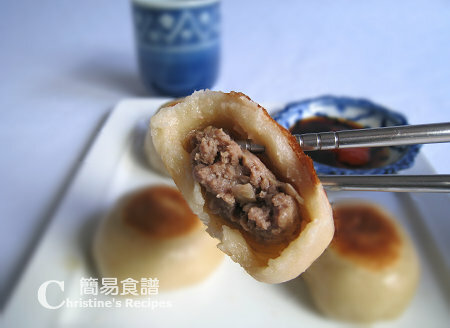 Press buns lightly and place wrapped beef buns in a single layer without touching with each other. Fry on medium-low heat until both sides are light brown. Add 4 tablespoons of boiling water, covered, continue to cook until the water dries up. Serve hot. The best beef buns are those have moist and maintain a bit of juice inside, crisp outside. When cooking buns with water, don’t overcook, or let your buns being cooked too dry up. The beef won’t take too long to be cooked through. Christine, when will you come back to HK? Sure, you can make it, could be better than me. Oh my goodness, these buns look incredibly tasty - I know I could not stop with one! These fried buns sound absolutely scrumptious! Would love to try them! I want to try these! I think I would absolutely love them. Will make a note to myself to try them over the Christmas holiday! gosh I can eat everything in that pan! I can't wait to try these! Why is it that you can only stir the meat filling in one direction? One time when I made dumplings, the filling was a bit tough and my mother in law said that I should have stirred only in one direction. (And my mom said the same thing too.) Just curious to know why stirring in one direction makes the filling "springy". I love your blog by the way, it's my new favourite food blog! awww....that makes me homesick. Looks so good. If I make that, I think I'll eat that for breakfast, lunch and dinner...hehe. Hahha, you have got me, I am drooling!!! Making me wanting to go back to HK already! Can any part of the recipe be made ahead of time? Can the buns be kept for some time after they have been cooked? They look absolutely fabulous and utterly delicious. The fillings can be made in advance and kept in refrigerator. Also, the cooked buns can be kept in freezer for 2 weeks, in a sealed bag or air-tight container. Reheat them before eating. If I don't have preserved cabbage.. can I use something else instead?? thank you:) this loks wonderful. Just add beef and onion, or chive with pork, that would taste good too. That looks so good. I can't wait to try this. Hi, i love your recipes. I made this one tonight & they were really juicy. Quick question, if freezing them, what would be the best way to cook please? Think that the best way is to cook the buns first, then keep them in freezer because it'll keep longer.